Eve is a versatile wrap dress with endless potential. With two stunning variations creating completely different looks, theres so much fun to be had with this pattern! Whether you go boho romantic for summer garden parties or sleek and elegant for everyday, the Eve Dress will keep you dressed up in style. Floaty, feminine and romantic, variation 1 makes the ultimate summer wedding outfit. It dreamily harks back to the 70s with its dipped hem, on trend statement sleeve and gently relaxed fit. This variation will have you dancing around the garden barefoot in no time. Understated and sleek, variation 2 features a more contemporary silhouette, with narrow elbow length sleeves and a level knee length hem. Elegant and wearable year round, its a great wardrobe staple; a sure fire go to for Friday evening post work drinks. Both dresses feature a pretty gathered yoke, wrap over front and a long tie closure. 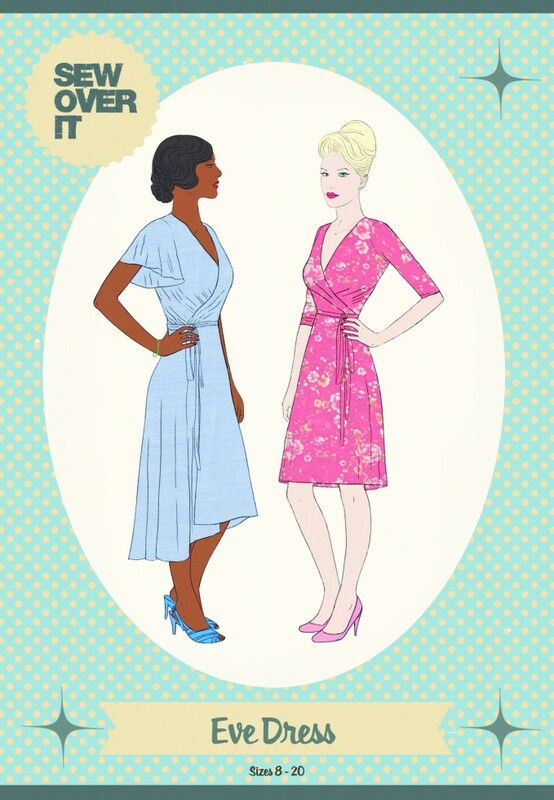 The Eve Dress sewing pattern is designed for sewers with some experience of lightweight drapey fabrics. With relatively simple construction, ambitious beginners might like to make their first dress in a more stable fabric such as cotton lawn or voile. Eve works beautifully in lightweight woven fabrics with some drape, such as rayon, viscose, crepe and georgette. Less experienced sewers could try a lightweight cotton such as lawn or voile. With minimal seams it makes the perfect dress for showing off those big bold prints.